Presenting Our New Facility and Construction Sale in San Antonio! Benson Honda is excited to offer you some information about the construction of our new building as well as our Construction Sale! American Honda has been updating their corporate image for the past seven years, and our new facility will be aligned with Honda’s innovative, eco-friendly image. It will be a Generation 3 Honda facility, which means it will meet the latest standards set by American Honda to improve customer satisfaction, reduce energy consumption, and enhance the way we do business. Our construction crew is hard at work to design a facility that helps achieve greater sustainability and helps improve our overall effectiveness to comply with Generation 3 facility standards. 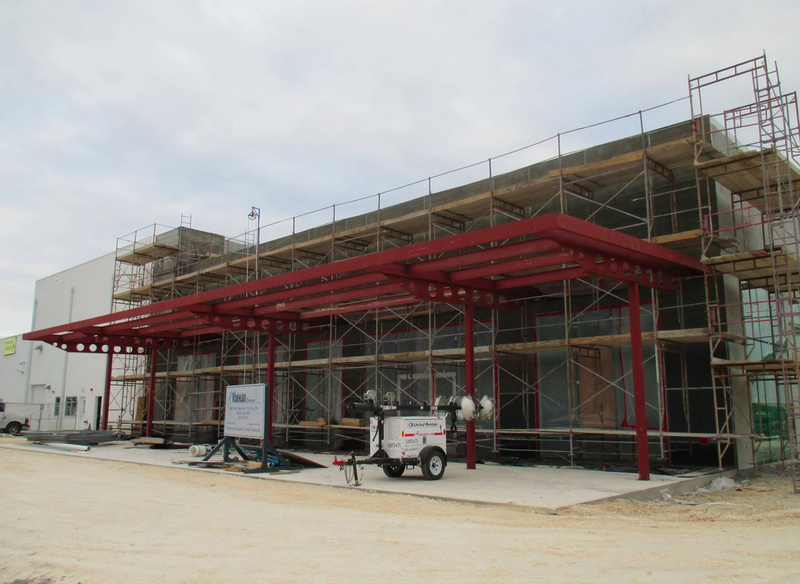 Once the building is complete, we’ll be the first Generation 3-aligned dealership in the San Antonio area! Our new building will have multiple TVs and customer computers for you entertainment and enjoyment. There will also be a quiet section of our waiting area for customers who wish to work or read while they wait. Plus, there will be plenty of snacks and refreshment options in our waiting area’s café! Our new building will also give us the extra space we need to park over 400 new and pre-owned vehicles on our lot. Not to mention, we’ll have the space for 500 additional vehicles at our offsite storage lot. Combined, this will allow us to have the best selection of vehicles in the San Antonio area. Additionally, our new facility’s LED lighting system will save energy and offer better lighting for those looking at the vehicles on our showroom floor. These are just some examples of what’s to come in the new year! Our shiny new building opens January 2015 for vehicle Sales and March 2015 for Service. We can hardly wait! To celebrate the construction of Benson Honda’s future building, we’d like to help you save on our 2014 Hondas. We’ve discounted most of our 2014 Honda inventory by $1,200 (or more). The best part is that this discount can be combined with existing factory incentives to save you even more! (Just keep in mind that the discount may vary on make and model). Our Construction Sale only lasts for a limited time. So, be sure to stop by our dealership today to save on your new Honda! There’s a buzz going on in San Antonio, Texas and it’s all about the Big Event Bonus at Benson Honda. Customers who fill out a form on our website and bring it in can be eligible for the $1,000 Big Event Bonus. Hondas are selling and they’re selling fast. Benson Honda surely has a great Honda just for you. Now is the greatest time to buy a new Honda. Honda’s production schedule is completely expected to be back on track by the end of summer and dealers are filling up their lots. The Big Event Bonus gives car shoppers an opportunity to, of course, get into a new Honda, lower their monthly payment , trade-in their current vehicle and with that $1,000 bonus possibly keep some more of their own out-of-pocket expense. The Big Event Bonus really is the time to check out Hondas. Hondas have been receiving award after award lately, especially with the new Civic lineup. The 2012 Civic sedan received an overall rating of ‘good’ across the board from the Insurance Institute of Highway Safety—the highest rating possible. The fuel efficient minded shopper need not only look to hybrids, which Honda has plenty, the fuel efficiency of Honda will impress all. Honda and Benson Honda want to reward customers and the Big Event Bonus is just the way to do it. We know that Honda is known for reliable and durable vehicles, but we also want our customers to know that Honda appreciates its customers. Whether you’re looking for an SUV or sporty two-door, Benson Honda, the leading new and used Honda dealer in San Antonio, Texas has them all—what’s holding you back from coming to check out a Honda at Benson Honda?